Are you a chef and want to own the coolest meat slicer in town for your next catering gig? Or a deli shop owner who wants to get the best out of the equipment you buy for the shop? Well, no need to fret. This guide to the Best Meat Slicer of 2018 will help you for sure. But first, let’s deal with the basics. Do you really need a meat slicer? Or will it be just another equipment left lying around waiting to rust? These are the advantages of getting one. If you are a customer, buying packaged pre-sliced meats are pricier than non-sliced ones. That’s a fact. So the small amounts you save per pack can bring big savings in the long run. Great thing is, the meat slicer is not just for meats. It can cut cheeses, vegetables and other things that you throw on its way. If you own a deli, having a meat slicer can give you a lot of savings too. First of all, you need fewer hands to do the slicing which means you have a lesser number of people to pay. Another thing is, a meat slicer can give you precise cuts tailored to your customer’s requirements which would lead to better reviews, more customers, and better income. If you are in a rush to prepare food and find your meats still frozen, a meat slicer can be your best friend. Since it can cut through anything even ice, prepping frozen foods is a no-brainer. This would also prove to be helpful especially when you are cooking for a big family. Slicing thin hams and steaks can be done in a jiffy. The meat slicer is equal to two of your best knives minus the effort and the possibility of getting cut. Given the advantages of getting a meat slicer, for sure you will be itching to get a hold of one. If you do, then this review of the best meat slicer picks for 2018 would be valuable to you. This all-in-one meat slicer is made of high-grade carbon steel that is chromium-plated to protect it from corrosion. The blade passed through a process of high- temperature treatment, thus, is sharp enough to withstand slicing chores without the need to sharpen it frequently, stays durable even after all the wear and tear and has a longer lifespan. The slicer is equipped with an on/off switch that has double illumination so there is no need to worry about power shock. It has a premium v-belt which lessens noise and vibration. For safety purposes, it has skidproof rubber feet that prevent it from being moved easily especially during the slicing process. It has a blade ring guard which keeps you protected especially when the equipment is accidentally bumped. It is also approved by US certification agencies such as FDA, ETL, and NSF which guarantees that it has passed quality standards. The Beswood250 meat slicer can slice meat, cheese, vegetables, bread, and ham so it’s perfect for commercial and home use. It weighs 33 lbs so is lighter compared to other brands. It can give slices of 1-12 mm. This electric meat slicer has a 12” high quality 304 stainless steel blade while its body and base is also made of quality material, aluminum alloy, thus, stays durable and corrosion-free. The firm blade allows it to cut meat, vegetables, fruits, and cheeses effortlessly whether the desired thickness is paper thin or up to 0.6mm. The best thing about it is that it has dual whetstones sharpener that is already built-in the equipment so the blade stays sharper for a longer period. It has safety features such as blade ring guard, skid-proof rubber feet and an on-off switch with a waterproof cover. To make cleaning a little easier and ensure that no bacteria is left to spoil your food, the meat slicer has an easy-remove product tray. It makes very little noise, thus, may be used in the shop or at home. It is also approved by ETL, NSF, and FDA so you are ensured of its quality. It weighs 60.55 lbs so it’s heavier than BESWOOD250. If you want an industrial quality meat slicer, then the Giantex Commercial Meat slicer is right for you. It is equipped with a 10-inch blade that is stainless steel and with an aluminum body. It is semi-automatic, very efficient and energy-saving too. Just like the KWS Meat Slicer, it also has a built-in whetstones sharpener. The difference is that it has sharpening control buttons which allows you to easily sharpen both sides of the blade. For your protection, it has a blade cover and an on/off switch with a waterproof cover. It has both a fixed device handle which pushes the fixed meat for slicing and moving handle as well to make slicing an effortless task. 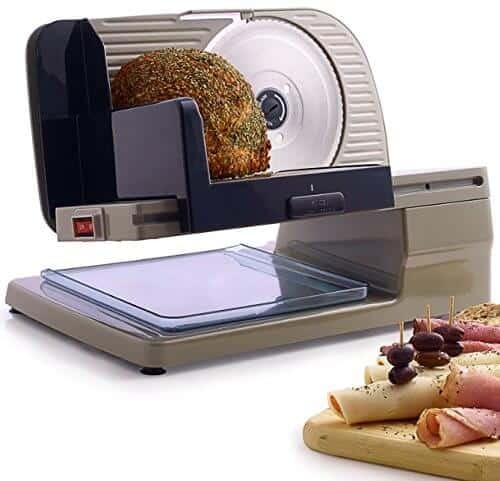 It can slice anything from frozen meat, huge boneless meat, to simple cheeses and fruits up to 0-0.47” slices. It does this with a very low noise level so it doesn’t add to the noise in your home or your shop. Also, under the meat slicer, you can find heat output holes that disperses heat as needed. All of these features come neatly packaged in this 36-lb meat slicer. This product is called “chef’s choice” for a good reason. It is described as rugged yet sophisticated as it combines powerful performance and sleek design in one package. The slicer operates through a highly powerful torque motor and a smooth gear drive that lets you slice continuously. Coupled with a durable 7” stainless steel blade and aluminum body, you are sure to have a powerful and efficient partner in your kitchen. With its tilted food carriage, slicing is made fast and efficient. At 10 lbs, Chef’s Choice Food Slicer is the lightest meat slicer among the top picks in this review. It also has a built-in slice thickness control that gives deli-thin to around 3/4″ slices. For its safety feature, it has a special lock button for securing food carriage so that access to the blade is limited when not in use. Next in line is the Sportsman MSLICER Electric Meat Slicer. It boasts of a 7.5” stainless steel blade which can cut up to 5/8″ thick slices. Whip up sandwiches for the family with ham, roast beef, and turkey. It is also best for cutting vegetables and fruits. With this meat slicer, you can organize that house party in no time! This meat slicer is best for home use. To keep it in place during the slicing process, it is fitted with a slip-free suction cup feet. This way you don’t have to worry about it falling off the counter while it does its work. Cleaning it after won’t be a problem at all since it is rigged with a sliding table that is so easy to clean. It weighs 13.2 lbs so it is very handy and portable. 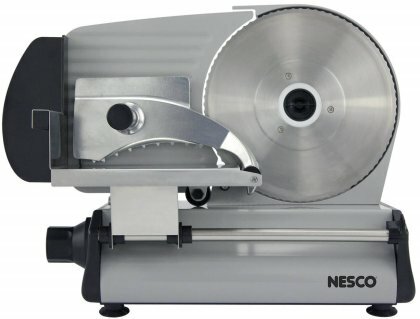 Another best meat slicer pick is the Nesco FS-250 food slicer. Its 8.7” stainless steel blade is of the mid-range size and serrated, thus, can handle food of any size and shape. The blade is also detachable so cleaning won’t be a problem. It also has a blade cover that proves to be very helpful in keeping users safe from accidental cuts. Its components include a sliding food carriage that is 100% stainless steel and an aluminum food press that makes the equipment durable with a longer lifespan. Similar to the other variants discussed, it has a thickness control knob that can be adjusted up to 9/16.” It functions through a 180-watt gear motor that is 100% high quality. No need to worry about the machine breaking down while slicing for that catering gig. The slicer is equipped with a hand guard that keeps your hand from touching the blade while slicing. This handguard has tiny spikes on it that keeps your grip secure and prevent it from sliding easily. It weighs only 13. 2 lbs so it’s lighter than other brands. This professional meat slicer features two interchangeable blades – a bread blade which can cut meats, fruits and bread and the more heavy duty universal serrated blade. Both are 9” and made of serrated blade. Get deli thin slices or thick 5/8″ without a sweat with the slicer’s thickness control knob that is easily adjustable to satisfy your needs. The Kitchener slicer’s housing is made of a combination of high quality coated steel and die-cast aluminum, thus, very durable and designed to last. Having a compact design, it can be easily transferred from one part of the kitchen to another and does not need much storage space. Another advantage if you get one is that it is easier to clean since all parts such as the blade, food carriage, pusher and deflector, and thickness guide plate are all easy to remove from the equipment. With its thickness guide plate, you can easily slice up your meat, cheese, bread, and vegetables for up to 5/8 “ thick. For its safety features, it has a suction cup feet for stability and a stainless steel carriage with finger protection and an end-piece holder that leads to perfect cuts without compromising safety since the user does not have to touch the meat while slicing. Before this review ends, here are some of the things that you have to take note of before you purchase one. 1- Before you get a meat slicer, ask yourself some questions first. Is the equipment worth the investment? Do you really, absolutely need it? Are you willing to spend for its maintenance? 2- If you answered yes to the questions, then your next move is to determine the specifics. What specific requirements do you have for your meat slicer? Consider the following questions. Do you want it for home or commercial use? 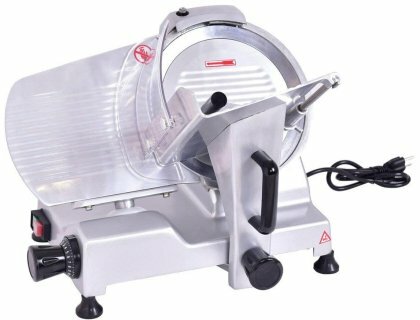 Do you want a heavy duty slicer or not? What safety features would you want it to have? Do you want it big, small or just right? How about the slice thickness? 3- Study your options. Choose well from among the options given above or you can also consider other brands or variants available in the market today. 4- There are other things to consider before you purchase that meat slicer. Space requirement. Meat slicers are bulky tools so you need to have a good place to fit it in your kitchen or shop. So consider where to set it. Before you shell out money, check if you have an available space for your meat slicer. Also, it cannot just be any space. It needs to be flat, stable and spacious enough to accommodate the meat slicer and the meat or any other food you are cutting. Cleaning up. This is one of the dreaded tasks especially with bulky equipment like this one. Since it is used for food, there is no doubt that you should clean it thoroughly to avoid bacteria and other unwanted harmful germs from getting into your food. You don’t want to end with food poisoning cases especially when you are in the business of selling food. Additional expenses. Of course, in order to keep the meat slicer functioning well, you should get machine oil to be used during every clean up of the machine. Take note that the machine oil should be food grade since other types would leave your food with a not-so-good aftertaste. Another thing that needs to be bought is an extra blade in case the current one is not in an A-okay condition. Surely, the best meat slicer makes your kitchen life a little easier. Whether you want one for commercial or home use, there is a meat slicer that would best fit your needs. 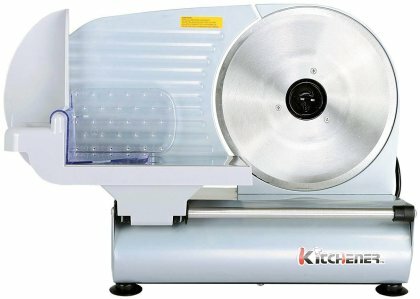 Our top pick for home use is Giantex Commercial Slicer with its safety features and side. For your deli shop, we think that the KitchenWare Station Premium Commercial Electric Meat Slicer is best with its blade size and safety features.